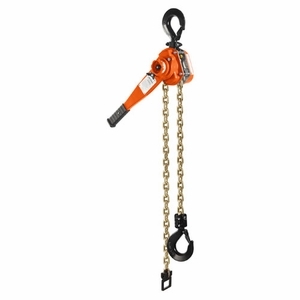 A High-Quality Lever Chain Hoist with the Features You Need! The CM Bandit is one of the most compact and durable ratchet lever hoists in the industry. Its lightweight and portable design, easy free-chaining feature and 360º rotating handle make it one of the most versatile hoists on the market today. Now available in 3/4, 1-1/2, 3 and 6 ton capacities for all of your pulling and lifting needs. Even better, all sizes are guaranteed to ship within three days or less! All CM Bandit units for the U.S. market come standard with CM Smart ID--new radio frequency identification (RFID) technology from Columbus McKinnon. CM Smart ID can help simplify your inventory and inspection management processes. Before each Bandit hoist leaves the factory, a CM Smart ID RFID chip is associated with product information that is uploaded and stored on the CM Smart ID Cloud. This free information, which includes the Chip ID number, CM product code, product description and capacity, can be instantly accessed by anyone in your company, anywhere, at any time.